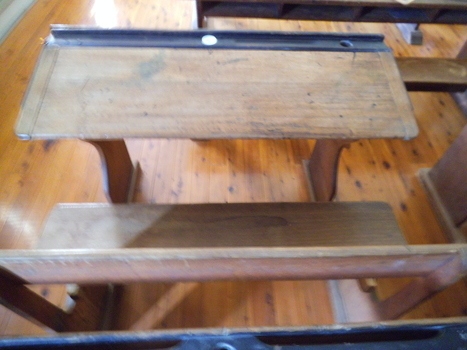 The Rutherglen Historical Society is based in the Common School Museum. Built in 1872, it was Rutherglen’s original school. 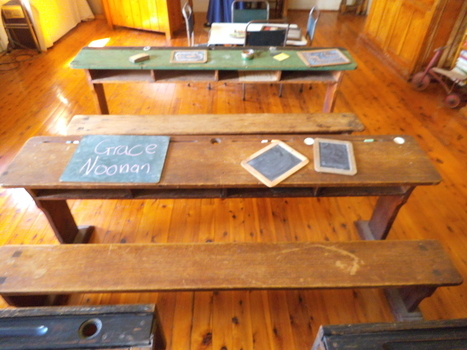 The Common School Museum currently houses a fascinating collection of historical artifacts from Rutherglen and surrounds. 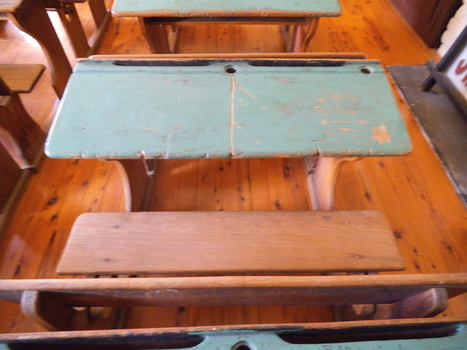 Farming implements, wine paraphernalia, mining equipment, early photographs and a perfectly re-created period schoolroom are just a few of the highlights. These records are digitised by this organisation on Victorian Collections for the purposes of education and preservation. If you believe that we have infringed your copyright please contact us and we will remove the material from the site. Rutherglen Historical Society - Link to our web page for more information about the Society and the Common School Museum. $2.00 per adult, children under 12 free. 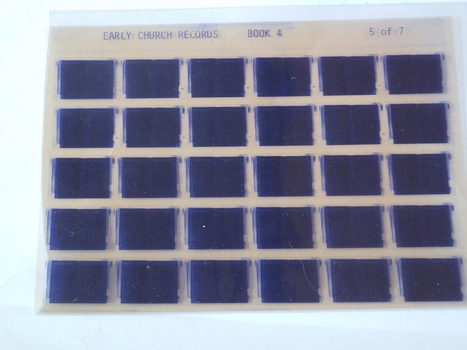 Individual school records of the pupils of the Higher Elementary School, Rutherglen. 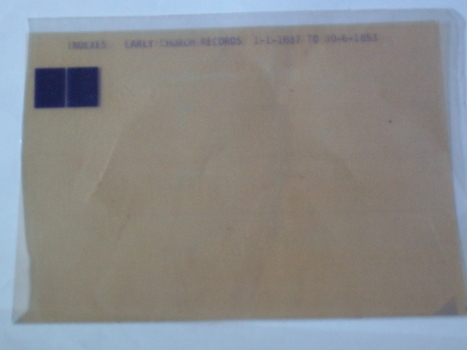 From School records, some more complete than others. Reports should contain information on the pupil's school work and give details of what they did when they left school. They should also show the name of a parent and the occupation. 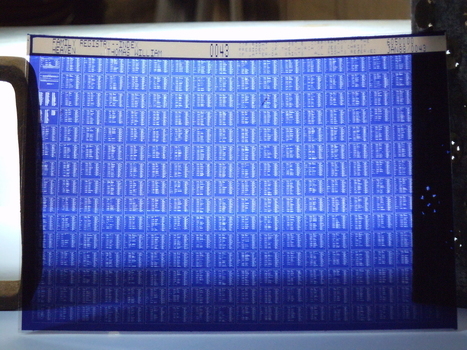 All sheets are indexed on a spreadsheet at the Common School Museum. 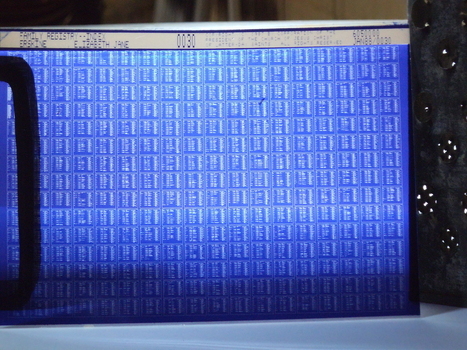 Unknown history. Probably T.L. 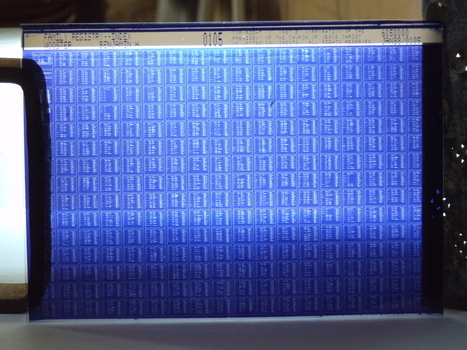 initials of owner. Used for hammering where iron hammer would damage. 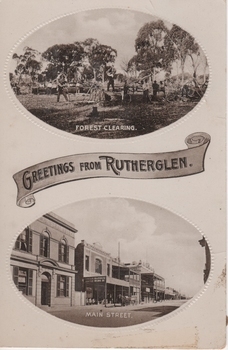 Black and white postcard with two oval photographs with "Greetings from Rutherglen" on a banner between them. The top photograph is of workmen cutting down trees. The bottom one is a view of Main Street looking west. At bottom of top photograph: "Forest Clearing." At bottom of bottom photograph: "Main Street." 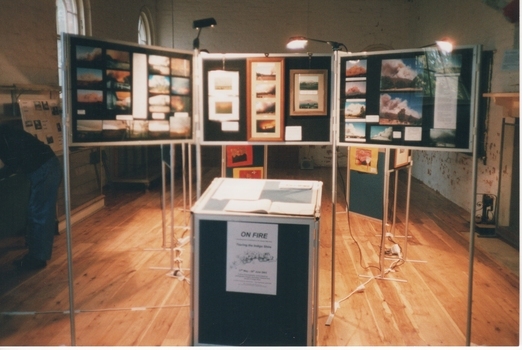 One of a series of photographs taken after refurbishment of Museum, during "On Fire" exhibition. 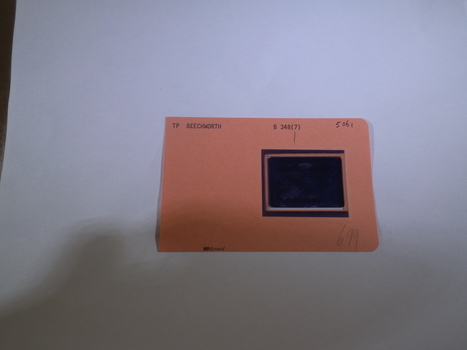 On back of photo: "7 Historical Society. Fire photos. 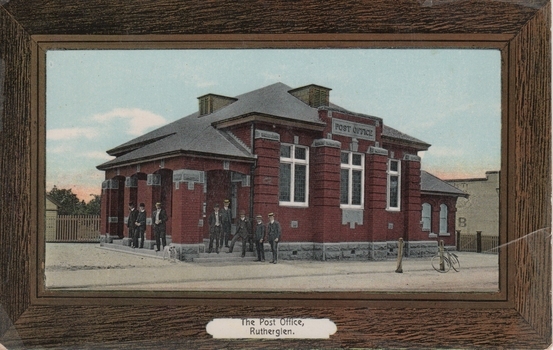 20/6/03"
Coloured photograph on a post card, with brown border, showing the Rutherglen Post Office with a group of men near the steps. On back of card: "From Sam & Wife to Charlie. 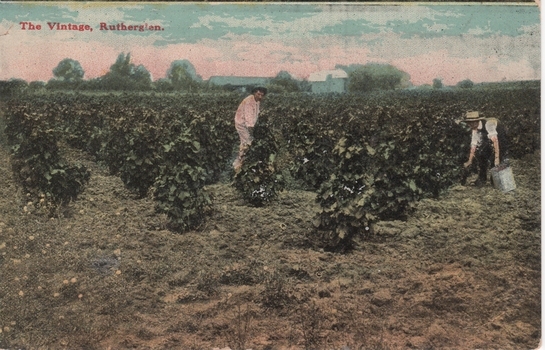 With best wishes, xmas 1911"
Coloured postcard photograph, of two men picking grapes. 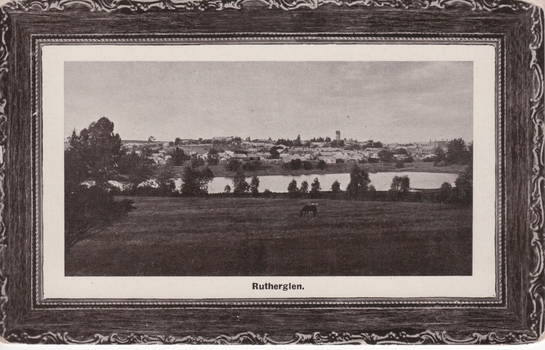 On back of card: "Published by F. Harrison, Rutherglen"
Black and white photograph printed on postcard with a decorative printed frame. This one shows a view of Rutherglen across Lake King. Printed at bottom of photo: "Rutherglen"
Newspaper article about the links between the schools of Rutherglen Victoria and Rutherglen Scotland. Photograph shows Rutherglen school students displaying the Union Jack flag. 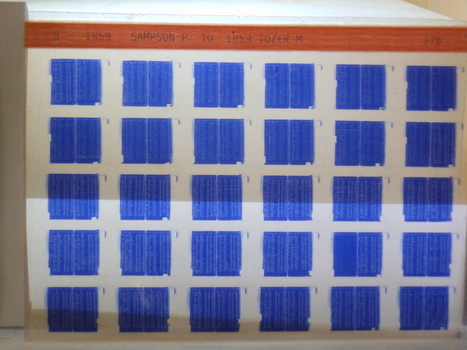 Also two photocopies of the article. 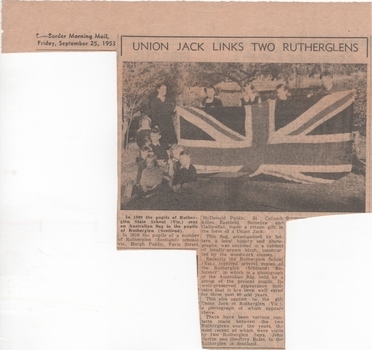 In 1909 students of Rutherglen State School sent an Australian flag to pupils of Rutherglen Scotland Schools, and a year later a Union Jack flag was sent to the Australian Rutherglen School and was used as a veil over the plaque to commorate 100 years since the laying of foundation stone. Black and white photograph of brick buildings, one of them with a tower. 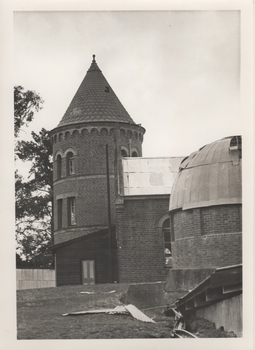 To the right in the foreground is a building with a domed roof, the roof in poor repair. Some of the buildings of the Mount Ophir winery. Photo was taken by Miss Olive Codling, who was a life member of the Wodonga Historical Society. 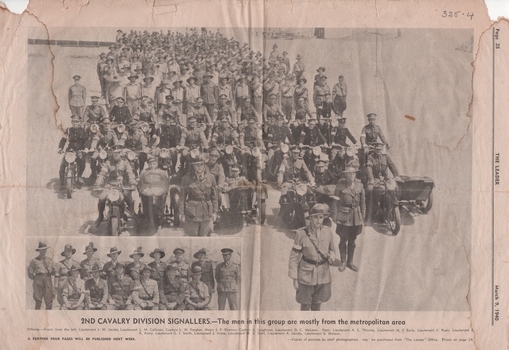 Photograph is believed to have been taken on the occasion of a Tour by the North East Branch, 1st combined meeting. Photograph from an unknown newspaper showing a group of men and women in formal dress. Six small girls, two of them holding baskets of flowers are at the front of the group. 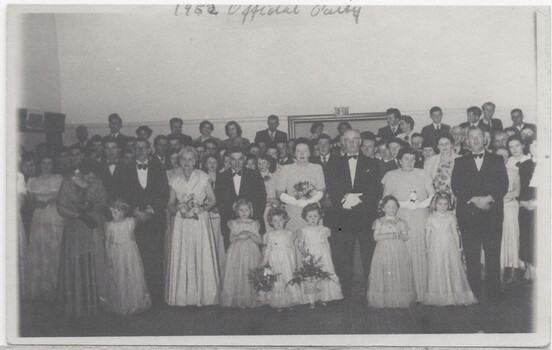 Thought to be of the Official Party at the opening of the Chiltern War Memorial Hall, or a function shortly after the hall was opened. At top of page: "1952 Official Party"